Modern trenches are intended to give cover from fire and from view. They are seldom roofed over, so that, as a matter of fact, they can be seen from the air, but it is not by any means an easy task either for an aeroplane to drop bombs there (a ditch three feet wide) nor yet for the artillery to hit them. But we seldom are able to inherit trenches—they usually have to be dug under cover of darkness while the enemy is sniping. For this purpose each man in the British army carries a small entrenching tool on his back, as well as two sandbags. Every man is trained in the use of this valuable little tool, and soon learns never to be without it. Trenches do not consist of one long straight line, but what may be described as a succession of little rooms, about twenty feet long, seven feet deep and three feet broad. They are seldom roofed over. Each little room is connected to the ones on either side by a trench that runs behind the four-feet square traverse that is of solid earth and which serves the purpose of localising the effect of shells, bombs, etc. If the trenches were in one straight line, a shell that fell there would be liable to injure a great many men; whereas under the present system the traverse acts as a buffer and limits the radius of its explosive force. The trench itself is dug about three feet deep, care being taken to lift off the top layer of grass and keep it aside to place over the front of the earth on completion of the trenches, to render them less visible. As the earth is lifted out it is thrown to the front and rear, and some of it put into sandbags which are then laid like stones as shown. The front part of the trench is then called the parapet and the rear part the parados. Both must be made strong, the parapet for reasons already given, and the parados in order to protect the men from the force of shells that fall just behind the trenches. About a foot from the ground there is placed a board that is called the “firing step,” on which the men stand when they are about to fire. I have said that there is seldom any roof over the trenches. It is difficult to cover in the trenches because of the limited supply of materials. Then again it is questionable if roofing pays; for, admitting that they may be able to keep out small bombs and rifle bullets, they can never hope to be able to keep out shells. The Germans used to roof in a great deal—but then they were there to wage a defensive war and did not propose to move for a good while. Some kind of floor should be provided for the trenches. The simplest and best are made in the following way: Take two seven-inch boards about ten feet in length, nail them together to make a f ourteen-inch plank, and then cover the whole with fairly fine chicken wire. Place these boards on the ground with the side on which the wires are joined downwards. They keep the feet from slipping, are easily cleaned by being upended when they are dry, and allow the space under them to be reached easily to pick up scraps of food, etc. There is nothing more heart breaking than having to pursue your weary course for miles, sometimes, up trenches with slippery sides and sloping, wet, treacherous bottoms. In each trench there must be dugouts for the men to sleep in. The first ones that are made will be very primitive, and will be very much like a fireplace in a room—simply excavations in jthe back wall of the trench almost on a level with the bottom of it. At first they used to be dug in the front of the trench, but this practice was discontinued as it was found to weaken the power of resistance of the very important parapet. In the course of time more labour can be expended upon the dugouts, and it will be found advisable to construct them of uniform size, six feet long by four feet wide by four feet high. By having them uniform we give the engineers a chance to make frames that can be used to support the roof and the sides and bring them well from the rear to construct the dugouts. These dimensions do not make a very commodious home for four men, but never more than three of a section (of four) are off duty at the same time, and besides there is considerable danger in having large dugouts, as they present a correspondingly larger target for the guns. A direct hit on a large dugout will often bring the whole thing crashing about the ears of the inhabitants. My own adjutant and one of my brother officers were killed by falling beams in large dugouts. The entrance to the dugouts must be kept as small as possible so as to protect the occupants from shells that fall just outside. Support lines were usually dug at a distance of thirty to eighty yards from the firing line. In them we kept a few men to be used in case of emergency. This line was an exact duplicate of the front line and was intended to be used in case we were pushed back. The reserve line was about five to eight hundred yards back from the front line and was not brought to any very great degree of completion. Interspersed between these three lines were many redoubts, or especially strong points containing machine guns, etc., whose defenders were expected to hold on to the very last and take advantage of their more secure position to make the attacker pay dearly for his advance. All these lines had to be linked up by communicating trenches, which started about a mile in the rear of the front line and went up in zigzag lines to the latter position, crossing the other trenches on their way. These communicating trenches are used for the purpose of bringing up troops and supplies, etc., and for taking to the rear the men that have been wounded. It is usually arranged to have some of these trenches “Up” and some of them “Down” roads. 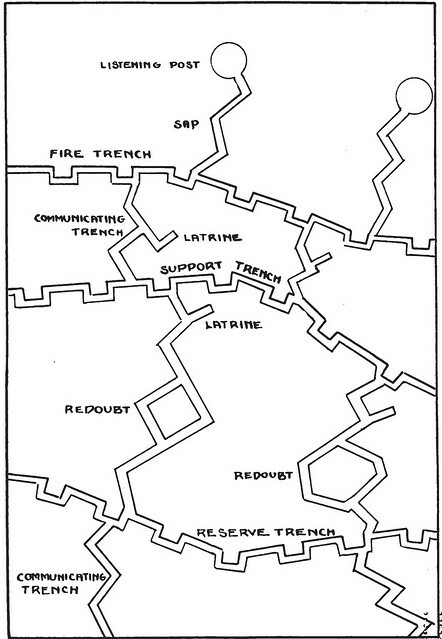 Each line of trenches (except of course the “communicating”) contain dugouts for the use of the troops that hold them. The distance between the communicating trenches varies from twenty-five yards to three or four hundred according to the state of perfection of the trench system. For special weapons such as machine guns and bomb guns, special shelters have to be made. Extra strong parapets are provided as well as head cover of railroad ties, and every effort is made to keep the exact position of the machine guns secret from the enemy. We soon learnt that he was very anxious to find our machine guns and would shell us liberally in the hope of being able to locate them. Care must be given to the question of drainage. Small ditches should be dug at intervals of a few yards to lead the water to pits in the rear. In Flanders, where we were very near river level, we installed hand and power pumps to keep the water from taking possession of the trenches. Even then, on rainy days we sometimes were in water up to our waists. Great care must also be taken in the construction of latrines. The method that was followed was to dig a short “blind alley” trench at right angles to one of the communicating trenches, and at a distance of twelve or fifteen yards from the front line. Starting from the end of this blind alley, the trench was gradually filled in with earth as it was used. In other cases biscuit tins were used as receptacles and the ordinary sanitary squads emptied them at specified times into a fairly deep pit. These latrines should be well protected with sandbags to keep the enemy from finding them and training a machine gun on them, in the knowledge that they were very likely to get some of the men who used them during the day. When I was writing a scene with my character running through captured German trenches, I found diagrams like these. Reading the above, what strikes me is that training manuals had so little to do with actual conditions. The rest of the book is pretty thorough about expected conditions–though it makes everything seem pretty upbeat, lol. Wow. I never fail to learn something from your blog. What an amazing piece of text! I wonder which audience it was written for… not the 18 year old boys, I am guessing. I saw the trenches in Gallipoli, in dry, rocky and quite exposed land. For Western European theatres of war, it was much more important to note that care had to be given to the question of drainage. I wonder it they really did install hand and power pumps to keep the water from taking possession of the trenches, or not. The most common disease seemed to have been foot rot. It was written by a Brit for American soldiers coming over in 1917! And the men did have hand and power pumps in the trenches, but I would assume that conditions made them difficult to use unless things had quieted. This makes a lot of sense after watching that mini-series with Eddie Redmayne. Gah, what was it called??? Bird-something. Evangeline, this article reminds me of the National WW1 Museum in Kansas City, MO where there is an extensive exhibit dedicated to trenches. Thank you for the fascinating article.
. “Birdsong” was what Eddy Redmayne was in, from the novel by Sebastian Faulks. A great read too.